Remarkable (...) and hugely recommended. One of the internationally most well-known Finnish composers, Aulis Sallinen (b. 1935) celebrates his 80th birthday in 2015. As a tribute, Ondine is releasing the 2002 production of his most latest opera, King Lear with the same cast that premiered the work at the Finnish National Opera in 2000. King Lear's premiere was a great success with a strong cast of singers under the direction of Okko Kamu. 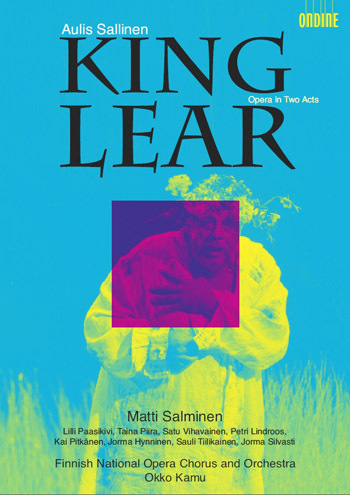 The title role of King Lear is sung by the legendary bass Matti Salminen. Other singing roles include Lilli Paasikivi, Taina Piira, Satu Vihavainen, Petri Lindroos, Kai Pitkänen, Jorma Hynninen, Sauli Tiilikainen and Jorma Silvasti. The libretto of the opera is based on the world-famous tragedy by William Shakespeare which tells the tragic story of the English king Lear, who struggles with both members of his own family and his enemies, as well as with his developing madness.